OSCA (Old School Computer Architecture) provides a home-computer era hardware platform for the V6Z80P. As well as basic memory and peripheral control, its features include bitmap and character mapped displays, sprites, a raster line synchronized co-pro (“LineCop”), blitter, hardware line draw and four channels of 8 bit digital sound. In OSCA, memory and peripheral controls are accessed via the Z80's In/Out Ports. Video settings such as the palette, display controls, sprite registers etc are accessed via locations in Z80 address space (these can be paged in and out as desired). Sections of Z80 address space are also assigned to video RAM etc. 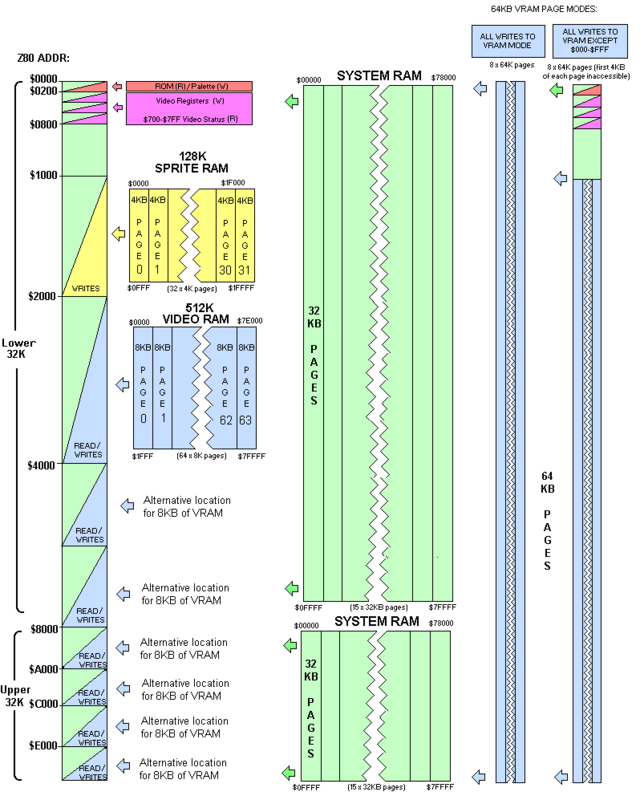 As the V6Z80P has 512KB of system RAM (and the Z80 can only see 64KB at a time), OSCA allows the user to select the sections of System RAM that appear in Z80 address space. The page size is 32KB and both the lower and upper halves of the Z80 address space can be assigned different pages of system RAM. In addition, the upper memory area can direct CPU writes to an alternative page, making data copying quicker and easier. Depending on the memory control settings, certain sections of Z80 address space will - instead of system RAM - access components such as video/sprite memory, the video palette etc. $1000-$1FFF The next 4KB Section of the lower 32KB System RAM page or a write-only 4KB page of sprite definition RAM (note: Reads between $1000-$1fff always fetch data from System RAM). The System RAM chip is 512KB. OSCA allows separate 32KB pages of this memory to appear at Z80 $0000-$7fff and $8000-$ffff. The 32KB chunk of system RAM that appears to the Z80 at $0000-$7FFF is set with the port “sys_low_page” and the 32KB of system RAM that appears to the Z80 at $8000-$FFFF is set with the port “sys_mem_select”. If required, WRITES between $8000-$FFFF can access a different page to that of READS in the same range - the write page is set with port “sys_alt_write_page”, and this feature is enabled with bit 4 of “sys_mem_select”. $0700-$07FF Write video registers but read only the video status register and maths result. Video memory is a seperate 512KB RAM chip. It is normally accessed by the CPU through an 8KB window in Z80 address space. The window is located at $2000 by default but can also be at $4000, $6000, $8000, $A000, $C000 or $E000. The location of this window is set with the port “sys_vram_location” and the 8KB section of Video RAM that the window 'contains' is selected by writing to the video register “vreg_vidpage” with bit 7 clear. To access video RAM at the location specified (instead of normal System RAM), video RAM must be paged in by setting bit 6 of the port “sys_mem_select”. (see bit 5 of “sys_mem_select”). This settings allows a 64KB page of video RAM to occupy the entire Z80 address space. This mode overrides all other paging options and forces memory WRITES from the CPU to video RAM at the page selected with bits [5:3] of “vreg_vidpage”). The CPU still reads data from ordinary system RAM (so that program code is always accessible). Because devoting the entire 64KB of Z80 address space to video RAM severely limits the CPU (calls, stack ops, IRQs, system variables etc are not possible) there is the option of excluding the first 4KB of Z80 address space from Direct Video Write Mode (set bit 6 of “sys_mem_select” as well as bit 5) - this allows access to the video registers and 2KB of system RAM at the cost of losing access to the first 4KB of each 64KB video page. Sprite RAM is another seperate RAM chip, this time 128KB in size. It is accessible to the CPU via a 4KB window at $1000-$1FFF. To enable this window, set bit 7 of “sys_mem_select”. Note that in OSCA, sprite RAM is write only and reading from $1000-$1fff always returns values from system RAM. The 4KB page of sprite RAM that is visible to the CPU is selected by writing to the video register “vreg_vidpage” with bit 7 set. These port locations are mainly both readable and writeable. However, the read (IN) functions can differ from the write (OUT) functions – see the individual port descriptions for details. The System RAM area where Linecop programs need to be placed are normal memory locations as far as the CPU is concerned, IE: they are not dedicated to the Linecop. Interrupt masks: Allow peripheral status flags to interrupt CPU. Bits 0:7 - Data byte received from keyboard. Only read this port when the “byte received” flag (bit 0 of sys_irq_ps2_flags) is set or you may get incomplete data. Bits 0:7 - Data byte received from mouse. Only read this port when the “byte received” flag (bit 1 of sys_irq_ps2_flags) is set or you may get incomplete data. 0 Joystick port 0/1 select - determines which port is active. Note: Writing 1 to the keyboard (or mouse) Clock line prevents the next data byte received by the shifter from setting the keyboard (or mouse) IRQ flag (in fact it clears the IRQ flag) - this is to stop bytes written out appearing in the input buffer. Incoming or outgoing data byte for RS232 com port. Note: When a byte is received, the “serial byte received” flag (bit 6 in Port $05) becomes set (this can cause an IRQ if desired). Reading this port clears the flag. Joystick inputs and RS232 status. 0 Last line (VRT). Reads as 1 during the last line of each frame. Note: Remember, in VGA mode each scanline's data is output twice at double the normal frequency. This flag reflects the x-window of the normal PAL/NTSC ~15KHz scanline. The timer internally counts *upwards* from this value at 62.5KHz (ie: every 256 clock ticks) when it overflows, it sets the timer IRQ flag, then reloads the count from the value that was written here. Note: Writing to this port immediately sets the timer to the written value and clears the internal prescaler count. To read the hardware version word, set the address bus bits 11:8 to $0-$F when reading this port (ie: use the “OUT (C),A” instruction, presetting register B with 0 to 15). The bit addressed by B will appear in bit 7 of this port. The SPI port is used by the V6Z80P to send bytes serially (MSB first, SPI mode 0) to its SD Card interface. Also, serial data received from the card's D_out line appears here for reading. See also: SPI speed setting in Port $05 and busy flag in port $09. 6 “Read/Write First 512 bytes of System RAM” - When set, the system RAM “underneath” the ROM/palette at $000-$1ff is accessible as normal System RAM locations for read and write. Note: If bit 4 is set, this setting is ignored. 4) To ensure the ROM is paged in upon reset and the system can start, this port register is reset to $00 when the reset button is pressed. This port contains data bytes from the SPI FPGA configuration EEPROM, which can be read under CPU control. It should be read only when the “serializer status flag” (bit 4 of port ”sys_hw_flags”) is 1. Reading this port clears the internal bit count and status flag. Handshaking: When a databurst has been initiated (see PIC comms section) the PIC issues a new byte every time the PIC CLOCK (bit 1 of ”sys_pic_comms”) is raised. This port selects which 32KB page from the 512KB system RAM appears at Z80 $0000-$7fff (see table below). Bear in mind the ROM/Palette, video registers and sprite page will still occupy Z80 address space locations: $0000-$01ff, $0200-$07ff and $1000-$1fff respectively regardless of which 32KB page is selected UNLESS these locations are specifically banked out of the address space with their respective control bits. 6) 000 and 001 both set the VRAM window location at Z80 address $2000 (It is not possible to set the VRAM window to Z80 $0000). Used by sound system, see following section. Maths unit register mirrors (of mult_read, mult_write, mult_index). Note: The audio channel location registers were expanded to 18 bit in OSCA v672. Previously, only 128KB of System RAM ($20000-$3FFFF) was accessible to the audio system. The sound location registers are 18 bits long in total and refer to WORD addresses (not byte addresses) in System RAM (samples need to placed at word boundaries). Basically you write (the actual RAM address / 2) into the location registers. Samples must be an even number of bytes in length - you write the length in WORDS into the Length registers (IE: Actual byte length/2). Maximum sample length is therefore 128KB. The location (low), length and period values are 16 bit registers and should be updated by using the Z80 “OUT (C),r” instruction where C is the port number, r holds the low 8 bits of data and B holds the high 8 bits of data. The volume and location (high) ports are 8 bit registers and can be updated with the normal “OUT (n),A” instruction if desired. The volume is a linear scale value (range: $00 = silence to $40 = full volume). The sound sample data needs to be in signed 8-bit format and located in System RAM (it is read by the hardware using DMA). The audio hardware ignores any memory paging settings and always reads directly from the system RAM when fetching data. The sound system operates in a similar fashion to that of the Amiga Hardware, ie: You set the location, length, period and volume of a channel, then start the channel playing with the relevant ”sys_audio_enable” port bit. Once the channel is playing, its Location and Length registers can be updated - the channel will only fetch the new values once its original length value has counted down to zero (or you stop the channel for a while and restart it). If the registers are not changed, the channel simply loops around playing the same sample data until it is stopped. Stop the relevant audio channel(s) and write location, length, period and volume. It's possible to use an interrupt to seamlessly switch between two or more sample buffers in order to play long samples without worrying about the exact timing. To do this you would start a channel playing, reload it with the second buffer ready for the first loop as normal, and then set up the audio interrupt so that it occurs upon the first loop (IE: just as the second buffer starts to play). In the IRQ service routine, you would set the channel location and length to point back to the first buffer, and on subsequent IRQs switch between the two buffers. Note: The four audio loop flags are OR'd into a single interrupt source. It is up to the IRQ service routine to read bits 4:7 of the ”sys_audio_flags” port, see which bits are set (and clear them on exit from the IRQ). Port $08 (”sys_audio_enable” / ”sys_audio_flags”) - to enable channels / read loop flags. The period value is not the same as the Amiga uses, however, it has 4 times the resolution so a close match value can be obtained if desired. The minimum period value is around 512 (corresponding to a sample rate of ~31KHz) - this is because the hardware only pre-fetches 2 samples during DMA per scanline (and there is a couple of cycles overhead etc). The default set-up is for channels 0 and 2 to go to the left side, whilst channels 1 and 3 go to the right side, but by writing to port $22 ”sys_audio_panning” all 4 channels can be individually directed to the left, right or both sides. OSCA has a single 8 bit internal counter which continually counts upwards, once every 256 ticks of the master 16MHz clock (ie: it runs at 62.5 KHz). It is not possible to directly read the value of the counter, instead the system sets a flag every time it overflows. This flag can be used as an interrupt source. When the counter overflows, it starts counting at whatever value was previously written to it. Writing to the port immediately sets the count to the written value and clears the internal prescaler count. Before enabling a new interrupt source, ensure your IRQ handling routine will clear its IRQ flag, otherwise the system will get stuck in an IRQ service-loop. When a full byte has been received by the internal serial-to-parallel shifter, the keyboard (or mouse) sets its “byte received” flag (see bits 0 and 1 of ”sys_irq_ps2_flags”). This flag in turn pulls the PS/2 Clock line low, meaning that the keyboard (or mouse) is blocked from sending any more data (it has to buffer it internally). If these flags are selected as an interrupt sources (see bits 0/1 of “sys_irq_enable”) then an IRQ will occur. To clear the flag, write to “sys_clear_irq_flags” with bit 0 (keyboard) or 1 (mouse) set after reading port (“sys_keyboard_data” / “sys_mouse_data”). When the internal scanline counter matches the value written7) to “vreg_rastlo” and “vreg_rasthi” a flag is set. To make this flag cause an interrupt, the value written to “sys_irq_enable” should have bit 3 set. To clear the video interrupt flag, write $80 to “vreg_rasthi” (this is a special case which does not affect the contents of the register). 7) The scanline match value must between 1 and the maximum number of lines in the video mode used. (PAL: 1 to 311, VGA/NTSC 1 to 261). Setting the scanline match value to 0 currently causes undesired effects (multiple false matches) due do internal counter limitations. When the timer has overflowed to 0, a flag will be set (see bit 2 of “sys_irq_ps2_flags”) At this point the timer reloads from the value originally written and continues. To make the overflow flag cause an interrupt, the value written to “sys_irq_enable” should have bit 2 set. To clear the timer IRQ flag write 2 to “sys_clear_irq_flags”. The audio interrupt can be used to detect looping channels as explained in the audio section. When a channel loops it sets its associated loop flag, all 4 loop flags are OR'd together into a single IRQ source. To enable this IRQ source, the byte written to “sys_irq_enable” should have bit 4 set. To clear the audio interrupt flag, all channels' loop flags must be zero - they are reset by writing to bits 4:7 of sys_clear_irq_flags. When a byte has been received in the internal shift buffer, a “byte received” flag becomes set (see bit 6 of “sys_joy_com_flags”). To allow this flag to cause an interrupt, the byte written to “sys_irq_enable” should have bit 6 set. Reading from “sys_serial_port” clears the byte received IRQ flag. OSCA only has a single byte serial buffer and no hardware flow control, however (unlike the keyboard and mouse) the value in the shifter is latched into a stable register until it is overwritten when the next complete byte received. The default OSCA ROM has the instruction JP $0A03 at $0066 (the NMI Vector). The only NMI source used in OSCA is the “NMI pin” of the expansion header block. When this signal is pulled low (and the hardware NMI inhbit feature is not enabled) the Z80 /NMI line is activated, causing a jump to $66. The “NMI pin” is readable in bit 7 of “sys_io_pins” and its NMI feature can be disabled by setting bit 0 of “sys_hw_settings”. 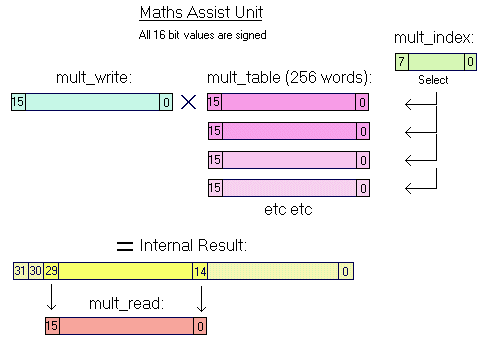 To use the maths unit as a simple 256 x 16bit look-up table, write your 16 bit words in the mult_table, put 16384 into mult_write and simply select the value by setting mult_index and reading from mult_read. To do an unscaled “multiply by a constant” (using only a single entry in the table) you need to adjust the multiplier and multiplicand to counter the scaling of the output. EG: To multiply $0087 by $0025 you could write $8700 into mult_write - (IE: a simple LSB/MSB byte swap) and $0940 into mult_table(0) (IE: $25 * $40). As the second word needs more processing, this would be your pre-set constant (you could fill the rest of the table with other constants if desired). There is 512KB of “background video” RAM available (separate to sprite, audio and system memory). It is normally accessible to the CPU in 8KB pages (at Z80 address $2000, $4000, $6000, $8000, $A000, $C000 or $E000 depending on the port setting “sys_vram_location”) with the page selected by the video register “vreg_vidpage”. However, a special write-only mode also allows the entire Z80 address space to be mapped onto a 64KB page of video RAM. There are two main video modes, bitmap and tilemap - both allow up to 256 colours. The display is normally non-interlaced, PAL ~50Hz or VGA/NTSC ~60Hz (there is an option to force VGA to non-standard 50Hz). CPU access TO VIDEO MEMORY whilst the display window is being generated is blocked by the video system. The different video modes affect how long the CPU is kept waiting - Dual Playfield tilemap mode is the most demanding. In standard chunky bitmap mode pixel data is fetched in a simple 1 byte = 1 pixel fashion (it is called “chunky” as all the bits for each pixel come from the same 'chunk' - IE: location - in memory). The byte fetched from VRAM represents an index in the video palette, therefore a $00 shows a “palette entry 0” coloured pixel, $01 shows a “palette entry 1” coloured pixel and so on. Data is fetched linearly from VRAM left to right, top to bottom of the screen. The data-fetch start address can be manipulated to achieve smooth scrolling effects. Fast line draws (125ns per 256 colour pixel) are possible in chunky mode. The hardware requires Bresenham constants, octant number, video start address and length of line to be set up in the line draw registers, then the hardware carries out the algorithm. The registers are doubled up, allowing line set-up data for a new line to be loaded up whilst the previous line is being drawn. Chunky mode also offers “pixel flooding” (see bit 6 of “vreg_vidctrl”) which repeats the last pixel colour to achieve flood fill effects. In this mode, the hardware XOR's each new pixel with the value of the last. The stored colour is reset to zero at the start of each scan line. In planar mode the display can have up to 8 bitplanes which are internally combined to form a palette index for each pixel. As the number of bitplanes can be set (see “vreg_yhws_bplcount”), the maximum number of colours on screen (without reloading the palette registers mid-screen) can be 2,4,8,16,32,64,128 or 256. This can offer efficiencies in terms of video memory use and update speed. The main disadvantage is that fine pixel-level access is more difficult. The bitplane location address registers can be manipulated to achieve scrolling effects etc. (Fine horizontal pixel scrolling is provided via a hardware scroll register (“vreg_xhws”). To set the location of display data, write to the Bitplane Location Registers at $240-$27F (see register index for details). The location registers need only be written once, an internal counter adds an offset internally as the frame is built up (this offset register can be reset at any time). For convenience, there are in fact two sets of location registers - the video hardware uses the set determined by bit 5 of the video register “vreg_vidctrl”. A modulo register is provided also - this can be used to skip bytes at the end of each scan line - useful for hiding new scroll data, interlaced displays etc. In tile-map mode the display is built up in a less direct manner: The hardware reads a look-up table to display a predefined block for each tile position. The blocks can be 8×8 or 16×16 pixels in size (defined in a simple, linear “1 byte = 1 pixel colour index” left to right, top to bottom fashion). Dual playfield capability is provided so that one map can be overlaid on top of the other (pixels of value 0 are taken as transparent). The playfield priority is selectable. Each playfield can be offset by 0-15 pixels in the vertical or horizontal direction allowing smooth scrolling. There are two map buffers per playfield which allows double buffering if desired. The registers “vreg_vidctrl”, “vreg_ext_vidctrl”, “vreg_xhws” and “vreg_yhws_bplcount” contain the control bits for the tilemap modes. The most basic OSCA tilemap mode limits tiles to 16×16 pixels, indexed with single bytes allowing a maximum of 256 different tiles. Two sets of tile definitions are available with 248 and 256 tile images respectively (Tile set A has fewer definition blocks available because the video memory for blocks 0-7 (VRAM $0-$7ff) is assigned for use as the four available tile maps.) This simplistic system is referred to as “Legacy Tilemap mode”. Extended Tile Mode provides more flexibility and may be a better choice for new programs. The horizontal size of the tile map buffer is always 32 bytes, no matter what the size of the display window. In Extended Tilemap Mode (IE: when bit 0 of “vreg_ext_vidctrl” is set), tiles are indexed by 2 bytes and can be 16×16 or 8×8 pixels. There is a single set8) of 2048 16×16 tiles or 8192 8×8 tiles (the “tile set select” bits used in legacy mode have new meanings in Extended Tilemap Mode.) The tile maps are located between at $70000- $73fff in video memory, well clear of the tile definitions which are located at VRAM $0 (The memory space used by the tile maps will produce garbage tiles if indexed). Bits 6:7 of the upper byte of the tile indices control x_mirror (Bit 6) and y_flip (Bit 7) of each tile definition. 8)Although the tile definitions are normally indexed in a straightforward linear manner, there is an option to switch between the definitions held at VRAM $0-$3FFFF and $40000-$7ffff. In 16×16 tilemap mode, the width of each horizontal map line is 32 bytes no matter what the size of the display window. Each tilemap has room for 16 rows of tiles (ie: a 256 scanline display), however when using vertical hardware scroll, the maximum y window should be 240 lines to mask off the last tile-line (where the internal tilemap line pointer wraps back to 0). In 8×8 tilemap mode, the width of each horizontal map line is 64 bytes no matter what the size of display window. The hardware scroll registers still provide a 0-15 pixel offset. Each tilemap has room for 32 rows of tiles (ie: a 256 scanline display), however when using vertical hardware scroll, the maximum y window should be 248 lines to mask off the last tile-line (where the internal tilemap line pointer wraps back to 0). There are actually two palettes, allowing buffering etc. Either palette can be set to “live” status (IE: accessed by the video hardware to build the video frame) or “target” (IE: receives writes from the CPU / LineCop). This is set with the register “vreg_palette_ctrl”. The position of the edges of the display window within the maximum visible TV screen are programmable (which - of course - sets the size of the window). There are 16 possible locations each for “X Start”, “X Stop”, “Y Start” and “Y Stop”. Each horizontal step is 16 pixels wide, and each vertical step is 8 lines tall. 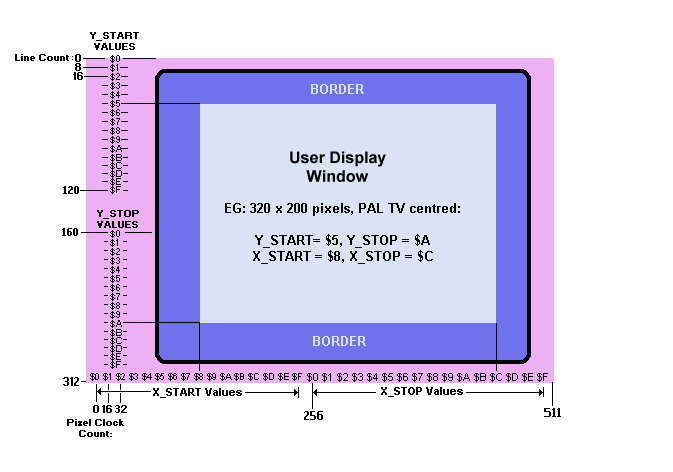 The register “vreg_window_size” sets the position of the display window. Note: both vertical and horizontal location settings are written this same register, its function changes depending on bit 2 of “vreg_rasthi” (see the example at the end of this section). The table below shows all the possible combinations of X_START (the green rows) and X_STOP (blue columns). Where a column and row intersect, the value is the width of the display in pixels. Note: X_Start values 0-4 (in red) are positioned well off the left hand side of the display so should not be used. A good, centralized 320 pixel wide display choice would be the value $8C. The X_Start and X_Stop values correspond to bits [7:4] of an internal low-res pixel clock counter (which counts from 0-511 on each scanline). X_Start values cover the count range 0,16,32,48 etc (the beam actually enters the left side of the visible (PAL TV) display somewhere around count = 96). X_Stop values cover the count range 256,272,288,304 etc (the raster beam leaves the display somewhere around count 496) Note: X_Stop 0 (count = 256) is not the exact middle of the visible display because the TV's raster beam does not advance during sync periods (at the extreme left of the display). The table below shows all the possible combinations of Y_START (the green rows) and Y_STOP (blue columns). Where a column and row intersect, the value is the height of the display in scanlines. Note: Y_Start values 0-1 (in red) are above the top of the display so should not be used. A good, centralized 200 line wide display choice would be the value $5A. The Y_Start and Y_Stop values correspond to bits [6:3] of the internal scanline counter. Y_Start covers the range of scanlines 0-120 and Y_Stop covers the range of scanlines 160-280. Because PAL/NTSC/VGA use differing amounts of scanlines to make up a full display, if Y_START and Y_STOP values are chosen to vertically centre a window, that window will be offset in other video modes. If vertical centring is important, a program must detect the video mode and adjust Y_Start and Y_Stop accordingly - note that this will also mean adjusting your Sprite and Linecop coordinates. The 60Hz mode flag in the Video Status Register can assist if the correction is to be done automatically, or a display adjust routine can be provided in user programs. To set the vertical start and stop positions of the display window, first write “vreg_rasthi” with bit 2 clear, then write an appropriate value from the tables above to “vreg_window_size”. To set the horizontal positions, write “vreg_rasthi” with bit 2 set, then write an appropriate value for the horizontal setting to “vreg_window_size”. Sprite definition memory accepts writes at full speed when the sprites are disabled. When sprites are enabled, writes from the CPU are forced to wait until the sprite hardware releases the RAM buses. The length of the wait during contention depends how busy the sprite hardware is on any given scanline. Access to the sprite control registers is never subject to contention. Each sprite definition block is 256 bytes long, with pixel data in a linear format “1 byte = 1 pixel” fashion, left to right, top to bottom of the sprite definition. Colour index zero is considered transparent by the sprite video hardware. Sprites are always 16 pixels wide but can be up to 240 pixels tall (the height of an individual sprite (in 16 line blocks) is set by its control register). The additional definition data for sprites taller than 16 lines comes from the blocks of sprite data following the specified sprite definition. Sprite images can be individually mirrored horizontally by setting a bit in their control registers - see detail below. There is enough time on any one scanline to show 55 sprites, but there are 127 sprite control registers. Therefore, this can be thought of as hardware multiplexing: Because it is uncommon for 55 sprites to appear on the same line, sprite images from all the registers will normally be displayed if spread throughout the entire display window. A double buffering mode allows half the sprite registers to be updated whilst the sprite hardware builds the display from the other half (the buffers are typically switched by the user's program each frame). This removes possible on-screen glitches and/or the need to dump data to the sprite registers off-screen. Bits in “vreg_sprctrl” are used operate this mode. The main priority control “interleave mode” is bit 1 of “vreg_sprctrl”, when this bit is zero, sprite pixels appear in front of all background data. When this bit is set to one, sprites use their pixel colour index MSBs to select one of the two background mask sets. In general, bear in mind the sprite layer is generated separately (and concurrently) to the background, and because priorities work solely on colour indexes care must be taken (especially in dual playfield tile mode) when designing the colour palette and the order in which sprites are assigned to registers. The mask registers are located at $280-$28F. Only two bits of each location are used: Bit 0 is the mask for “level 0” (where a sprite’s colour index MSB is 0) and Bit 1 is the mask for “level 1” (where a sprite’s colour index MSB is 1). The register at $280 holds the masks for background colours 0-15, the register at $281 holds the masks for background colours 16-31, the register at $282 holds the masks for background colours 32-47 and so on. Where each register mask bit is zero, the range of colours it will represents will appear behind sprites. Where a mask bit is one, the range of colours it represents will appear in front of sprites. In the above example (when interleave mode is enabled) sprites with pixel indexes in the range 00-7f will be occluded by background colours 80-ff. This is the default OSCA setting. 7:4 Height of sprite (in blocks of 16 lines) If 0000, the sprite is 240 pixels tall. Values below these positions hide parts of the sprite “behind” the border. The Window's X_START and Y_START values naturally determine how much of a sprite can be masked by the border. Horizontally, the full width of an individual sprite can be masked many times over on the left. The Y_START value allows a minimum of 16 lines of vertical (top border) masking (when using the recommended minimum Y_START of 2). If more data of a tall sprite is to be masked, then its starting definition block and height can be adjusted. Therefore in this mode sprites can be 16,32,48,64,80,96,112 (or 240 when the three height bits are all zero) lines tall. Therefore in this mode sprites can be 16,32,48,64, and 128,144,160,176 lines tall (64 lines are used when bit 0 and 1 are zero). In this mode sprites can be 16,32,48,64 lines tall (64 lines are used when bit 0 and 1 are zero). Wait and Register Select instructions take 2 clock cycles to perform, Register Writes take 3 cycles. Linecop programs must be aligned at even bytes in memory, however bit 0 of the address (as written to linecop_addr0) is the Linecop hardware enable control. Therefore, the value written to this register needs be an ODD number if the linecop is to run. Hardware register $20f (linecop_addr2) uses the same physical address as vreg_palette_ctrl. Bit 7 selects which register is updated: 1 = write to Linecop address, 0 = Write to the palette register. Write to linecop_addr0 last, so that all the other address bytes are populated whilst the linecop is inactive. The LineCop's internal Program Counter is reloaded from the address held in linecop_addr0-2 at the end of every frame and also when forced by a LineCop write instruction which has bit 12 set. As the LineCop can write to its own location pointers and restart itself, automatic list cycling / page flipping can be achieved. Linecop programs should end with a wait for a line that is never reached, IE: $1FF (Use the instruction code hexcode $C1FF). When the raster reaches a scanline that matches that set by a LineCop wait instruction, the LineCop steals time from the CPU until it reaches the next Wait instruction. If the end of the scanline is reached first, the Linecop becomes inactive until the next frame. You should not WAIT for Line 0 as this currently causes undesired effects due to internal counter limitations. As the LineCop can access all the video registers including blitter etc, beware of malformed LineCop programs causing undesired effects. The linecop only ever writes to the hardware registers - never system RAM - EG: bit 7 of the port “sys_alt_write_page” is irrelevant to the LineCop. Although the Linecop uses the same internal line counter as the sprite system, there can be a difference in the values required to achieve visual alignment between the two systems. This is because each line of sprite data (like the background video) is buffered and displayed on the next line (see hardware timing). Other systems, like the colour palette, however will respond immediately to changes and show effects on the “live” scanline. In addition, some register writes are buffered until the end of a scanline so the effect of a change may not be visible until 2 scanlines later. A sprite y coordinate is set at $29, and appears at the top line of the display. If we wanted the Linecop to change one of its colours on its top row of pixels we should actually wait for line $2a with the Linecop. (The sprite data line is generated and buffered on line $29, but its pixels only appear a line later on line $2a). Note: It is possible to use the dual palettes to get around this issue. LD (linecop_addr0),A    ; When bit 0 of this register is zero, the linecop is stopped. OSCA’s blitter is a simple data copying engine that operates within Video RAM. It can transfer data around video memory much faster than the CPU (it copies one byte every 2 system clocks, compared with the Z80's LDIR instruction @ 1 byte per 21 clocks). Also unlike the CPU, it has 18 bit address registers so is not subject to banking issues. The blitter can run in ascending or descending address order and has modulo registers so that a rectangular area within a larger overall array can be shifted in one operation. Source bytes that equal zero can be skipped if required - this is mainly useful in Chunky pixel mode where it can be used to mask out “transparent” pixels (eg: drawing “bobs”). Blits take priority over access to video RAM from the CPU (but obviously the video datafetch at the start of each scanline still pauses the blitter). As long as the CPU does not access video RAM whilst a blit is underway, it will continue running its program from system RAM. OSCA contains a vector line drawing engine which can be used in chunky pixel mode. In a similar fashion to the blitter, this system takes priority over access to video memory and leaves the CPU free to do other things (it cannot run concurrently with the blitter, however). See the linedraw register list for full details of the register set-up requirements. The normal horizontal pixel resolution in TV mode is 8MHz and 16MHz in VGA mode - this means there can be approximately a maximum of 368 pixels visible on any one scan line. As there is spare bandwidth in TV mode, there is the option to increase the pixel rate to 16MHz, at the expense of colour depth (reduced to 16 colours max) – see bit 3 of “vreg_ext_vidctrl” - this is referred to as Hi-Res Mode. In this mode, the colour index of each normal pixel is split into two 4-bit indices (7:4 = Leftside hi-res pixel, 3:0 = Rightside hi-res pixel). This process is applied at final output stage of the pixel colour look-up and is merely a “filter” instead of a “real” hi-res mode. Because the sprite priority system is unaware of this filter, it still processes priorities based on 8 bit pixel values - therefore sprite interleaving should not be used in hi-res mode. As can be seen from the diagram below, each video line is internally buffered until the next scan line when it actually displayed. The sprites and background video layers are generated simultaneously to separate buffers and combined when the line is eventually clocked out to the display. A note concerning updating bitmap location pointers: Each line begins generation before the LineCop DMA starts, therefore even if the bitmap location registers are changed with the linecop at the start of a line (IE: immediately following a LineCop WAIT instruction) there will be some pixels at the start of the displayed line that were fetched before the pointers were changed. This can be avoided using double buffering via the 2nd bitmap location register set, alternatively the unwanted pixels can be masked with a wide border etc. Each scanline lasts for 1024 16MHz clock cycles in PAL TV mode (1016 cycles in NTSC or VGA modes). At the start of each line the CPU is taken offline by a BUSREQ signal for audio DMA. (There is short, variable delay of a few cycles following a Bus Request whilst waiting for an acknowledgment from the CPU). Once the audio system is online, it lasts around 20 clock cycles. Following on, the LineCop has control of the main system bus for as long as the necessary to complete the LineCop operations required on that line. Afterwards, the CPU continues normally (as long as it not forced to wait by it accessing video or sprite memory during active display lines). Bitmap and sprite video data is fetched simultaneously and concurrently with the CPU running normally as the three systems have their own memory buses. The time each system requires to build its internal buffer is variable and depends on the amount of data on a particular scan line. As mentioned, the CPU only has to wait if it tries to access bitmap or sprite memory whilst data is being fetched by the relevant system. The blitter and linedraw systems are also forced to wait during the bitmap fetch part of a scan line. These systems have priority over the CPU in accessing video memory when its free (not being read by the video system) and force the CPU to wait if the CPU is trying access bitmap video memory at the same time. Active blits are paused at the “last 16 cycles” point, ensuring the CPU is not waiting at the start of a scanline (which could cause complications with the DMA functions). A paused blit continues after the bitmap layer data fetch period. 8) This is a non-standard mode and may not work on all VGA monitors. All video registers are WRITE ONLY. “vreg_window_size” - Display Window Size - Sets size/position of display window. In Tilemap mode this register sets two separate hardware scroll values, one for each playfield. To set the scroll value for playfield 0, write to this register with bit 7 clear. To set the scroll value for playfield 1, write to this register with bit 7 set. 9) When this register is written with bit 7 set, the video IRQ flag is cleared and the rest of the register's contents are unchanged. The counter used in the line comparison starts 16 lines above the first visible scanline (same as the sprites). Note: PAL, NTSC and VGA have different numbers of scanlines and no interrupt will occur if this register and the MSB in vreg_rasthi are set to a line the display mode never reaches. Please use a value above zero. Setting the raster IRQ line to 0 (including the MSB in vreg_rasthi) currently causes undesired effects (multiple interrupts) due to internal counter limitations. This register selects which 8KB page of Video RAM appears in the Video RAM Access Window in Z80 address space (default location Z80 $2000-$3FFF). It also determines which 4KB of sprite RAM is to accept writes through the Sprite RAM access window (at Z80 $1000-$1fff). When the register is written with bit 7 clear: Function is “set video page”. When the register is written with bit 7 set: Function is “Set sprite page”. Remember, the video and sprite access windows must be enabled with the port sys_mem_select for data to be transferred from the relevant RAMs. 10) These modes force the upper bits of individual sprite height control registers to be reassigned, see the sprite description text above for details. Selects which word from the look up table is used for the multiplication. Note: Changes to the live palette selection take effect at the start of the next scanline, whereas changes to the target palette register take effect immediately. 13) Bit 16 is internally OR'd with the equivalent bit in “blit_misc”, this is for backwards compatibility. If you are only accessing video addresses < 128KB you can just use the “blit_misc” and ignore these two registers. Conversely if you are generally using the entire VRAM range its best to use these registers and write the MSB bits in “blit_misc” with zeroes. Writing to “blit_width” actually starts the blit operation. Remember, the height and width values should be the blit dimensions less one. Following a blit, all the registers except “Width” (which has to be re-written anyway) retain the values originally written to them. Most of the blitter registers can be changed once a blit is underway without problems, however the Modulos, Width and Misc registers should not be updated until a blit is finished. Be wary when leaving the blitter running and returning to other code – this is of course perfectly fine as long as the other code does not go on to access the blitter's registers before it has finished a blit. The blitter status flag (bit 4 in sys_vreg_read) should be examined at relevant points to prevent clashing blitter ops. 12) The modulo is the number of bytes added to the end of the source and destination counters at the end of each line. The polarity of these values is reversed by the blit direction. So if in descending mode, a negative modulo will result in a positive offset. The line draw system uses registers in the range: $220-$23f. There are two main groups of registers: Control registers that need to be set up for each line, and an overall look-up table that only needs to be set up once on initialization. Registers should be written with positive values, the sign of the value is held in the octant code. Writing to (the LSB of) this register actually starts the line drawing operation, so the sys_vreg_read should be checked beforehand. The following four 16 bit registers register addresses have the same function as registers $220-$227 above, but they can hold different values. Having two sets of line-draw registers allows one set to be loaded whilst a previous line draw operation is still running. (The line_draw busy flag in vreg_read only needs to be checked before writing to the LSB of linedraw_reg3 (or linedraw_reg7) which starts the linedraw, or the linedraw_colour register, if changing colour. The following eight 16 bit registers form a look-up table which is used by the internal harware to offset the plot address of each pixel. These registers need only be set once as part of an initialization routine, IE: not per line. As above for Bitplane location register set B. Bit 5 of “vreg_vidctrl” controls which set is used by the hardware to build the display. The value written to the bitplane location registers only needs to be set once, an internal offset counter is added to the address as the frame is built up. There is only one offset counter which acts on all the bitplanes - it can be reset to zero by writing to the 4th byte of the even-numbered bitplane pointers (eg: bitplane0a_loc+3) this actually takes effect at the start of the next scanline. The modulo register holds the number of words to skip at the right of each scanline (positive only). This allows a window from within a larger image to be displayed (EG: can be used for scrolling and skipping lines in interlaced displays). There is one modulo register, it is located at the 4th byte of the odd-numbered bitplane registers (EG: bitplane1a+3) - as mentioned, the granularity is 2 bytes so for example a written value of 1 skips 2 bytes each line. The value in this register is internally latched at the start of each scanline and because of the way it is implemented there is an upper limit on the value it can hold (depends on the display mode) - values up to 192 (IE: skip 384 bytes) are OK. There is also a special case: If $FF is written to the modulo register the bitmap offset counter is reset at the start of each scanline, IE: With no other changes, the same line is used over and over. 0 Last line (VRT). Set during the last line of each frame. 15) Remember, in VGA mode each scanline's data is output twice at double the normal frequency. This flag reflects the x-window of the normal PAL/NTSC ~15KHz scanline. Bits 29:14 from the longword result of the maths unit operation appear here. All interrupts are disabled (IRQs via the Z80 DI instruction and NMIs via bit 0 of sys_hw_settings). The IRQ vector (at $0038) has the instruction “JP $0A00”, and the NMI vector (at $0066) has the instruction “JP $0A03”. OSCA is designed to use Interrupt Mode 1. To test for bootcode, a “databurst” command is sent to a PIC microcontroller which responds by sending 3520 bytes from the EEPROM. The ROM reads this data into system RAM $0200 onwards, checks the CRC checksum (held in the last two bytes) and executes it (with a JP $200) if the checksum is good. The IRQ vectors must be set appropriately in system RAM when non-ROM reads are enabled (and interrupts are required).